"Schnitzel" is a popular Israeli dish where the meat or fish has been coated with bread crumbs and fried. There are variations - there are soy schnitzels, tofu schnitzels, baked schnitzels, chicken schnitzels, turkey schnitzels....but the basic meal is one which is a favorite with all communities throughout Israel. Several years ago, Nachum Shemesh, then living in Eliat, began to think about how to make the schnitzel meal, usually served in restaurants with potatoes and salads, into a "fast food". He developed the idea of cutting the schnitzels into small pieces and putting them into a baguette with various salads and sauces. Thus was born the Snitzel-ria, a little corner store serving schnitzel-sandwiches. When Nachum married Atara Mond, a Tzfat native, they considered where they wanted to live. With the impending birth of their first child, they decided to think about Tzfat, and Nachum began to check out the possibilities of opening his Snitzel-ria in Tzfat. He rented a small store-front on Tzfat's main commercial street and opened. 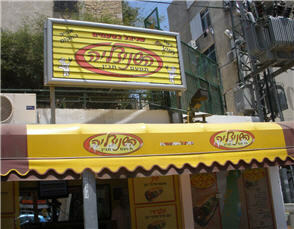 Within a short amount of time, the Snitzel-ria became a favorite fast-food place for Tzfat residents. They stayed open until 5:00a.m., so there were different crowds there at various times- kids and families during the day, men coming off late shifts at night, and religious men on their way home from late study sessions in the wee hours of the morning. The schnitzels are made in a variety of flavors - Greek, Spanish, Italian, and others, with various sauces and a wide variety of vegetables. The Snitzel-ria bakes its own baguettes whose smell wafts over the street. And the shop has now moved to a larger venue on Jerusalem Street, next to the landmark "Bridge". Today, the Snitzel-ria is a franchise, and Snitzel-rias can be found in Israeli cities and towns throughout the country. Nahum is now the father of 2 young sons, and he oversees the operation, opening Snitzel-rias in new locations almost monthly. But most evenings, he can be found at his first Snitzel-ria, on Jerusalem Street. He now sits on Tzfat's City Council as the representative of the shopkeepers of the city, and is looking ahead at rejuvenating the commercial center of Tzfat.